In 1892, on the urging of Stanford, who had become a U.S. senator, President benjamin harrison appointed McKenna to the Ninth Circuit Court of Appeals. 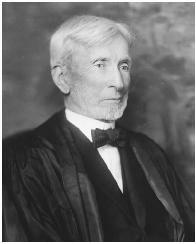 Opponents protested that McKenna was unqualified and, moreover, beholden to railroad interests, but the nomination succeeded. He held the seat for four years, largely without incident or note; yet occasionally he proved his critics right about his allegiances. In Southern Pacific Co. v. Board of Railroad Commissioners, 78 F. 236 (C.C.N.D. Cal. 1896), for example, he blocked the California legislature's attempt to set railroad fares, arguing that the proposed rates were unfair to the railroads. We wanted to protect the identity of the candidates," says orchestra president and CEO Joseph McKenna of the search's confidential approach. Joseph McKenna is one of the young South Dublin recruits at the centre of an Army investigation into neo-Nazi activities ordered by Defence Minister Willie O'Dea. In related news, Joseph McKenna has been appointed southeast regional sales manager by Acme-Hardesty. Fuller Chief justice 1888-1910 Joseph McKenna Associate justice 1898-1925 Edward D.
Joseph McKenna was so incompetent at the end of his term that, in the words of his colleague William Howard Taft, he once "wrote an opinion deciding the case one way when there had been a unanimous vote the other, including his own. Inter Boys: Tom Madden, Ben Martin (St Anselm's), Craig Gunderson, Harry Harper (Blue Coat), James McCully (Archbishop Beck), Andrew Newton (Castle Rushen), Lee Butterworth (Ballakermeen), Joseph McKenna (Holy Family). The full list is: John Heanneau, Mark Duncan, Linus Roache and Christopher Dormerr who played Peter as a boy; Scots actor Joseph McKenna, who played the teenage Peter in 1977; David Lonsdale (198688) and mostly recently Chris Gascoyne who left the show earlier this month after three years. Pictured holding the cup is Matthew Griffin, with Sean O'Brien (left) and Ryan Stewart, flanked (from left) by John Ormsby, Francis McGinty, Sean Brennan, Luke Coen, George Teggin, Niall Buswell, Joseph McKenna, Gregory Binns and Ryan Haraburda. Joseph McKenna, a William McKinley appointee, served for 26 years (1898-1925). Glasgow-born Joseph McKenna was the next Peter Barlow, appearing for a year from 1977. At Tooling & Production magazine (Solon, Ohio), Joseph McKenna is named editor, succeeding Jim Lorincz, who moved to Internet publisher VerticalNet, Inc.
Margaret was born in 1932 to James and Elizabeth Paterson and married James Joseph McKenna in November 1953.